Auckland man Chris Laird has confounded the experts and made an incredible recovery from a devastating stroke – thanks to radical surgery and tough love. Chris had such a massive stroke his wife Debbie was warned he might not survive. “He was in the operating theatre, and hospital staff rang me and told me not to be alone,” Debbie says. You can see more of Chris and Debbie in this NZ Herald article. 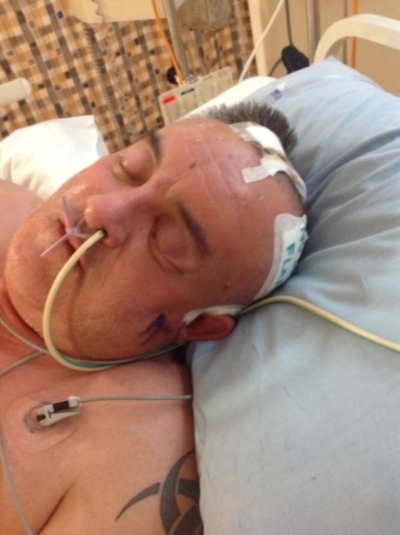 Debbie had found Chris, then 57, unconscious on the bathroom floor at home in October 2014. He was rushed to hospital where he underwent a frightening six-hour surgery. “Half his skull was removed, placed in a freezer, and put back on six months later,” Debbie says. Incredibly, Chris was back at work 13 months to the day – unloading imported cars at the docks. But it’s been a long journey, with Debbie as his chief carer and cheerleader. “We fought the doctors and we fought the neuro-surgeons, who told me there was no hope for recover,” Debbie says. Debbie, a hospice caregiver, said she had seen many carers who tried to do too much for their patient. So she adopted a “tough love” policy. But the tough approach worked for them. The pair say they now face a bright future, with some travel on the horizon and moving house. There’s been some setbacks along the way, with Chris needing three more surgeries because there were problems with a replacement piece of skull. “We think we’ve got it beat now,” Debbie says. And Debbie has begun a support group for stroke careres, which meets once a month. “Sometimes things that drive you up the wall can be quite funny when you talk to other people. It’s a really good get-together.